March 22, 2013 9:40 am Brent Warren Photo by Walker Evans. 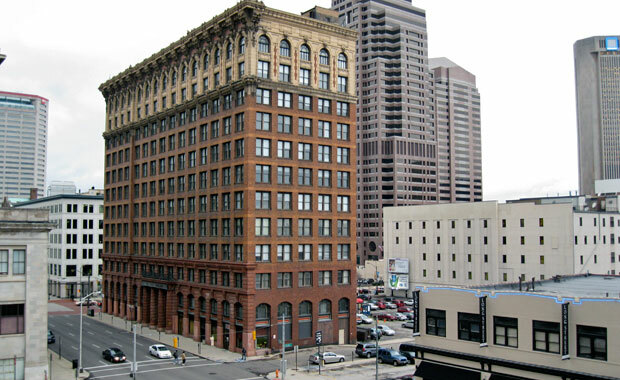 Plans for the Atlas Building at 8 East Long Street Downtown are starting to come together. Michael Schiff, Principal of the Schiff Capital Group, outlined the latest plans and gave some background on the project Wednesday night at a ULI Columbus event at the building. Approximately 100 apartments are planned, with a mix of studios, one-bedroom, and two-bedroom units. Parking for each unit will be available in the surface lot adjacent to the building. Earlier plans to put additional apartments on that lot were scrapped; Schiff said that providing structured parking to accommodate the new units as well as the ones in the Atlas Building proved too costly. The Atlas was built in 1905 and designed by noted Columbus architect Frank Packard. Schiff described it as “the only New York-style building downtown,” and said that the large windows and good views from all sides of the building should help these apartments stand out from other offerings in the immediate vicinity. Other planned amenities include a second floor deck, a fitness room, and easy access from the parking lot to a rear elevator for residents to pull up and unload groceries and other items. Four retail spaces are planned for the first floor, with one fronting High Street and the others along Long. Schooley Caldwell, the architect for the project, was represented at the ULI event by President and CEO Robert Loversidge. He expressed excitement about the building and the potential to highlight its historic features – the most prominent of which is probably its three-story cornice, which he said is in surprisingly good condition and will be lit up as part of the renovation. David Tumen of Porter Wright also spoke on Wednesday about the federal and state historic tax credits that were utilized to make the project happen. Schiff said that they hope to start construction in 30 to 45 days, and expect it to take about ten to twelve months from that point to complete. More information about Schiff Capital Group can be found at www.schiffcapital.com. Interior Photos by Brent Warren. Exterior Photo by Walker Evans.